As far as population density goes, New Mexico is one of the sparsest states in the nation with a total population of 1,984,356. However, there are still ample New Mexico commercial real estate listings to consider. The government of New Mexico does a great deal to promote business in the state and offers tax credits and technical assistance. With the goal of creating new jobs, the law in New Mexico allows the government to provide buildings and commercial realty to businesses. In some communities, there is an Economic Development Gross Receipts tax that is collected in order to market areas for business development. The economy of New Mexico is based largely on oil and gas. As the state is one of the largest producers of crude oil and natural gas in the country, much industrial space and office space is dedicated to these endeavors. In 2010, the Gross Domestic Product was $79.7 billion. If you are looking for investment property in New Mexico, it is important to note that property tax will be assessed on commercial real estate listings. However, property taxes do not apply for personal-use property. This lot is truly too good to be true! . Outstanding level three acre lot at the top of the mountain. Wonderful lot located right on our PGA Rated golf course. 0. Property is part of an Estate. The heirs would like to sell the property as is. 265 Ft +/- of Highway Frontage on Aztec Blvd. & 7.42 Acres +/- just West of County Offices in Aztec. 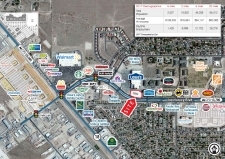 Super commercial location presently leased to State of NM, Dept. Commercial Building for sale in Lovington, NM. Great rental investment property located walking distance to NM Bluewater Lake State Park!. Location/opportunity in Far NE Heights! Great income producing 4-plex. Open floor plan with easy access to anywhere in the City. CLASSY OLD RUIDOSO ADOBE STYLE HOME! Zoned C-2 Commercial Business.